Information for Ordering and Using - HSIN GEELI HARDWARE ENTERPRISE CO., LTD.
1. Machining sizes, hole diameters and materials. 2. 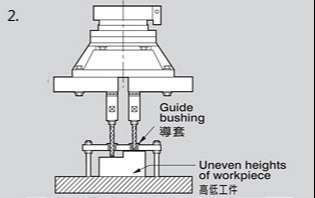 Machining type: drilling tapping reaming. 3. Drilling machine type and motor horsepower. 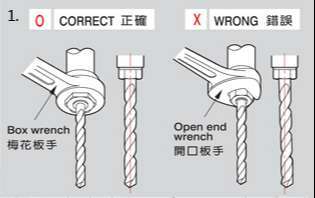 Use correct box wrench to tighten or loosen collet. Do not use an open end wrench for this purpose. Failure to comply may cause damage on the collet due to uneven tightening or loosening force or inaccurate chucking of cutting tool. Guide bushing equipped on the workpiece not only upgrades machining accuracy, but also ensure the service life of the spindle. 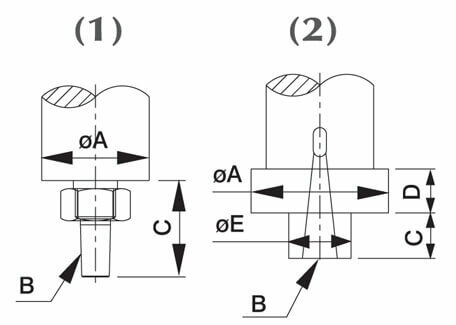 In case workpiece has uneven heights of surfaces, you need to lower the drill until they touch the various surfaces of the workpiece before tightening the cutting tools. Then you can tighten the cutting tools securely. 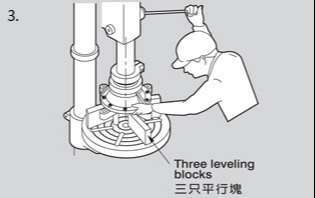 When mounting the multiple spindle drilling head, place three leveling blocks under it. Have them aligned with spindles, and press it until it reaches the main tooth. 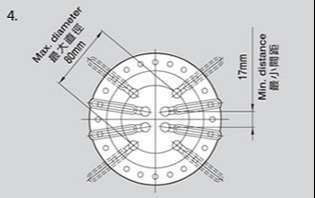 Minimum distance and maximum diameter diagram.